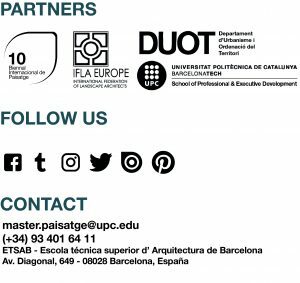 REMAKING LANDSCAPES – Master in Landscape Architecture Barcelona – Universitat Politècnica de Catalunya – 35ª EDITION. Within the master’s studios, in the end of the first academic year, a 100 hours intensive workshop takes place with the aim to offer to students the experience to work intensely with recognized personalities or/and emerging figures at an international level in the field of landscape education and professional practice. Guest professors suggest their own methodologies and personal approaches as well they usually propose the studio’s theme. Contemporary landscape topics such as public space at the edge of the Mediterranean metropolis, or a combination of urban and tourist use of specific landscapes, such as the coast, are discussed under a broader perspective. Is held over two weeks in July, 2020, with classes from Monday to Friday from 9 h to 14 h and 16 h to 21 h.